The Crimson's 11-1 record is helped along by its stingy 0.83 GAA; the team scored 5 goals and conceded only two this weekend, thanks to the defensive work of players like senior back Olivia Allin. Junior forward Maddie Earle collected three of the four goals Harvard scored this weekend as the field hockey team extended its win streak to eight games, which ties the program record set in 2016. Earle and the No. 11 Crimson squad defeated Brown and Boston University over the weekend to move to an 11-1 overall record on the season. On Sunday, Harvard (11-1, 3-0 Ivy League) faced off against the 23rd-ranked Boston University (7-5, 3-0 Patriot League). Throughout the first half, the Crimson was unable to find the back of the board even with five shots on goal. It took 24 minutes after the break for Earle to connect off a Terrier turnover, scoring her seventh goal in the last six games. Only three minutes later, freshman midfielder and forward Rachel Greenwood scored her second career goal. Earle, who now has nine goals and two assists this season, attributed her offensive explosion throughout the Crimson’s win streak to her teammates. Defensively, freshman goalie Ellie Shahbo collected her fourth career shutout. With the Terriers only having two shots on goal, Shahbo recorded two saves and her fifth win of the season in the net. For co-captain Kathleen Young, this game saw the freshmen on the team take the forefront. The Crimson traveled to Providence on Friday afternoon to face Ancient Eight rival Brown (4-7, 0-3) in its third conference game on the season. While Earle, assisted by Young, quickly found the back of the net six minutes into the first-half to give Harvard a 1-0 lead, the Bears continued to fight. Earle scored again 17 minutes later, putting the Crimson up 2-0, but Brown’s freshman back and midfielder Danielle van Rootselaar countered less than a minute later. Before the end of the half, the Bears had scored another goal to tie the game. Following the first-half defensive struggles, the Crimson protected its half of the field. In the last 35 minutes, the Harvard defensive front prevented the Bears from taking any shots, allowing for a second-half shutout. With 15 minutes left in the game, Young scored the game-winning goal, her fourth on the season, with an assist from Greenwood. According to Young, some of the struggles seen throughout the Brown game come with the territory of conference play. As the season continues, the Crimson does not have any weekends with more than one game. According to Earle, the light schedule helps as the team recovers from injuries and attempts to maintain the momentum from an 11-1 start. Harvard will continue its quest for the Ivy League title this Saturday, hosting Cornell at Berylson Field. The Crimson defeated the Crusaders by a score of 7-0, extending Harvard’s win streak to five and marking the second time the team has scored seven goals this season. Coming into its final game of the regular season, No. 16 Harvard field hockey knew that it had a chance to rewrite the record books. In last week’s win against Dartmouth, the Crimson tied the program record with its 12th win of the year. 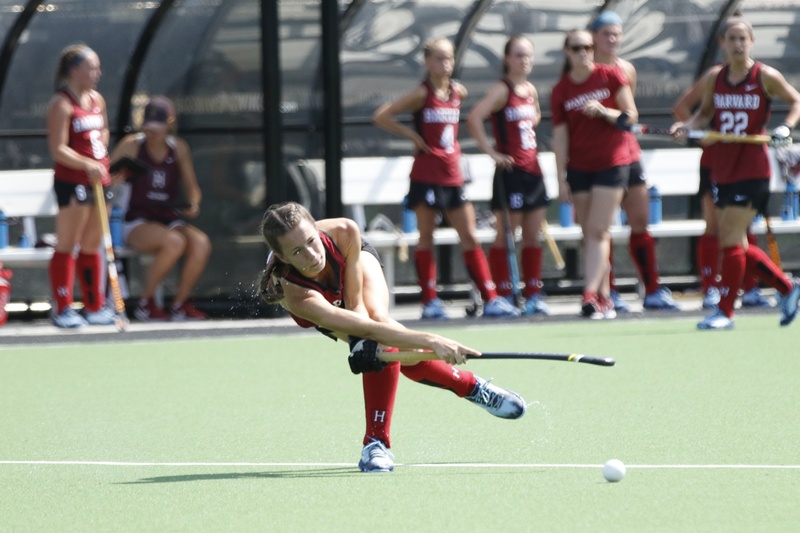 Thanks to a standout performance by freshman forward Mimi Tarrant, Harvard beat Columbia, 4-0, in New York, N.Y. to pick up a 13th victory and set a new mark for single-season wins.